Do you want a busier, more vibrant practice? Would you like to expand your team or number of locations? Do you want to get your associates busier? We can help you! Let’s start with the end in mind. Before diving into the many ways you could market your practice it’s important to be clear about what success means to you. We will guide you through outlining in detail what you want your future practice to be like, what kind of patients you want to attract to your practice, what kind of services you want to offer and what the best pricing strategy is. To avoid the very common feast and famine cycles, we’ll support you in putting a simple marketing plan in place, including strategies to attract new patients, retain existing patients ethically and keeping in touch with current and former patients. As word of mouth is usually the biggest source of new patients we’ll help you to come up with easy to implement and effective ways to encourage more referrals. Social media has taken the world by storm and has proven to be a great way to keep in touch with your patients and generate referrals. Having a plan in place is crucial to the success of social media. We also recognise that the growth of your practice is not just what you do but also what your associates and reception team do. 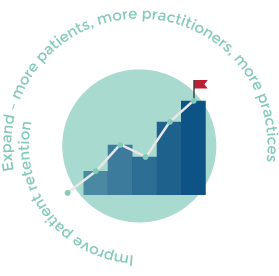 We are passionate about helping you to help your associates retain patients ethically and generate more referrals. Your receptionist is your director of first impressions, we have various ways to support you in making sure the first impression is a good one.